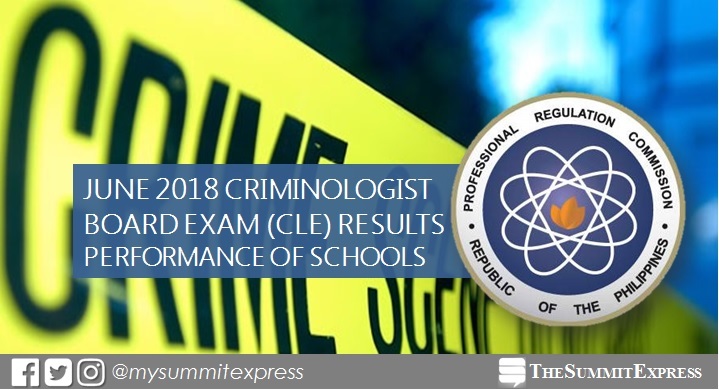 MANILA, Philippines – The Professional Regulation Commission (PRC) hailed the top performing schools in the June 2018 Criminologist licensure examination (CLE) or Criminology board exam. The result is out online on June 29 or in twelve (12) working days after the exam. PRC conducted the first CLE this year on June 10, 11 and 12 (Sunday to Tuesday) in Manila, All Regional Offices and Zamboanga. University of the Cordilleras (UC) is consistently topping the Criminologist licensure exam in the past years. In the June 2017 exam, UC led the schools with 95.88% passing rate or 93 out of 97 passed the tests. Lipa City Colleges ranked second with 91.18% or 62 out of 68 passed the exams. University of Baguio got the third spot, 82.93% or 68 out of 82 passed. In the April 2016 CLE, UC got 105 out of 107 examiness or 98.13-percent passing rate. Lipa City Colleges and University of Baguio (UB) ranked second and third respectively, 91.94 and 82.43-percent. Monitor this page for the real-time updates on CLE results. Check out also the official website of PRC for more information.